Dead birds, dead fish, dead crabs, oh my! If there was any lingering doubt that the apocalypse was, indeed, scheduled for 2012 it has been erased. The totally unprecedented death of thousands of birds, tens of thousand (or more) fish and tens of thousands of crabs has been universally accepted – at least by a few bloggers on the Internet – as a sign that now is the time to go ahead and run up those credit card debts. In fact, while I was waiting for the train from Waynesville to Asheville (man I’ve been waiting a long time) I overheard one guy say that his cousin heard someone say that Pat Robertson said it was evident that the mixed flock of birds falling from the sky in Arkansas was a message from above and that it was an abomination to find mixed species actually roosting together. “After all, we are supposedly at war, and our enemy has made it clear their intent to use biological and chemical weapons. If that is indeed a legitimate threat, doesn’t it make sense to know the truth before shrugging the events off to natural happenstance?” wrote Doug Hagmann in the Canada Free Press. But if, like me, you’re just gonna stick your head in the sand and believe what scientists and biologists are saying this is all you’re left with. In Beebe, Ark. 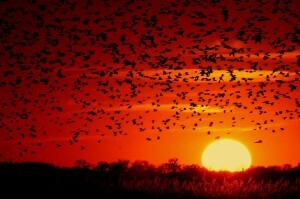 On New Year’s Eve blackbirds began falling out of the sky, perhaps as many as 3,000 were found dead. The culprit: Loud explosions, likely associated with New Year’s Eve celebrations disturbed a mega roost of blackbirds and starlings. The birds took to the air, in the dark, where they collided with buildings, power lines, etc. and fell from the sky. All necropsies tested negative for poisons and trauma was the cause of death. A similar situation occurred in Louisiana a couple of days later – blackbirds rousted from a roost in the dark and flew into structures – trauma was the cause of death. In Sweden, a couple of days later – dead jackdaws were found in the street. Was it a sign from God? Not unless he drives a lorry (bus), because a lorry driver admitted to driving through a large flock of birds. They were in the road eating the salt and grit from the snowmelt. Freshwater drum in the Arkansas River likely died from some type of pathogen because no other species of fish was affected. The fish die-offs in the Chesapeake Bay and the crabs in England were due to extremely cold temperatures. Sadly it happens all the time for a myriad of reasons. Some human induced, some natural causes like when migrating Lapland Longspurs got caught in a storm in Minnesota in 1904 and more than 750,000 died. I, personally, blame Al Gore for this debacle. If he hadn’t invented the Internet people would have never known about these disparate events.